Sometimes you need a second set of eyes. And I’m not just talking about dental loupes. As a business owner, sometimes you need to have a second pair of eyes looking out for you. Someone who has got your back, maybe…. And also someone who sees opportunity ahead that sometimes you don’t actually even see at all…. Because sometimes when you are focused on an outcome that may be way off plan or way off into the future, you miss seeing some day to day opportunities presenting themselves right there in front of you, staring back up at you in the face. I recently was discussing marketing with a dentist and his wife, who were building up a start up dental practice. The wife was working in the practice as the dental assistant and receptionist combined. Interestingly, the thought of marketing themselves as husband and wife together had never seriously crossed their minds. I suggested that some professional photos of the couple as well as of them and their children, strategically placed in the dental practice, would go a long way to building a stronger relationship with their clients. You see, sometimes we forget that new patients calling a new dental practice and then subsequently attending that practice are really quite terrified about what is about to unfold. It’s because of the fear of the unknown. They don’t know you, the dentist, and they are scared about what you are going to do for them. And as dentists, we tend to build up an immunity towards this serious emotion our new patients are going through. All that a new patient is looking for is assurance that they have made the correct decision in choosing your dental office. And the strategic placement of “happy family” and “happy couple” photographs around the dental practice go a long way toward sending the message out there to your new customer that they have now found their new dental home. It’s a subliminal message. And it’s a good one to use to your advantage when you can. Rather than not use at all…. Are You Trying To Please Every One Of Your Customers? One of the great fallacies of business is the statement that you need to please all of your customers all of the time. You cannot be available for every one of your customers twenty-four hours per day, seven days per week, three hundred and sixty five days of the year. No matter how much you make yourself available, there will always be someone who expects you to be available at times when you’re not. With regards to price, no matter what fee you charge for your goods and for your services, there will always be someone who feels that your prices are higher than they should be. No matter what services you choose to provide, and what other services you choose to refer, there will always be customers who believe that you should indeed be a jack of all trades and should give them what they want rather than what you are capable of and capable of doing well. No matter how good your equipment and no matter how fine your materials there will always be people who think that you should cut corners, or that you do cut corners. You need to work out where you are happy positioning yourself and your business and stay there. 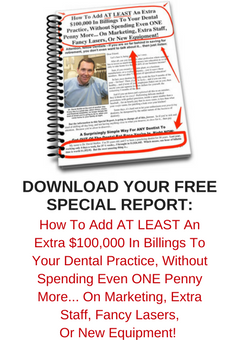 If you choose to provide affordable dentistry that saves your customers money, then be happy with the type of patients that this model attracts and be happy with the level of income that this business earns. Also be aware that this type of business is very susceptible to challenges from outside of your business, and be prepared to be able to stand your ground and “hold your position”. If you choose to position your business as the provider of fine dentistry in very comfortable surroundings that are pleasant to visit and pleasant to work in, be prepared for customers who may want this level of service but do not want to pay for it. Be comfortable that you have made the right decision for you. Consensus is an amazing thing. Doing things because others do it can often be a poor excuse when it comes to common sense and also to breaches of the law of the land. Dental computer software has its uses. But there are components of dental software that are clearly invented by geeks and have no logical use in clinical practice, that have now crept in to the day to day way that dentists operate their businesses. These activities are akin to the electric hand dryers we see in public bathrooms. They kind of seem like a good idea, but after using those drying machines, you still feel like you need to wipe your hands on a towel [or your trousers?] anyways…. I see dental practices with treatment rooms lined with cabinets upon cabinets upon cabinets. Not only are these cabinets installed at the same cost as purchasing a three bedroom home [with a pool!!! ], they act to magnetically attract all forms of junk and paraphernalia into them to justify their purchase… they are clutter magnets. Capital gain or Ordinary income? Lump sum arrangements received by dentists for supposedly operating as dentists within the confines of dental business owned by someone else are not to be treated as capital gains but are to be treated as assessable income according to section 6-5 of the Income Tax Assessment Act 1997. Just because someone tells you that you can be a “contractor” doesn’t mean that it’s an actual legal process. And having a contract stating you are a “legal” contractor doesn’t mean a hoot if your role is deemed to be one of employee. In just the same way that you cannot have a contract that legalizes bigamy, or murder, in lands where those actions are legislated against, you cannot be called a “contractor” if your conditions of engagement are defined by the tax office as being an arrangement between an employee and employer. These sham contracts are usually suggested by companies seeking to gain an unfair competitive advantage in the marketplace. These companies then rely on consensus to create an appearance of correct behaviour. The Australian Tax Office is clear on this. However, for some reason, your Dental Associations have tended to ignore the law. And when it does, those who have provided incorrect advice and also those who have avoided providing advice should be held accountable to their customers and members by class action. If you’re going to charge top dollar for what you do, you need to make sure that what you provide is BULLETPROOF when it comes to being above and beyond exceptional. Because if what you provide is missing in key areas, then it doesn’t matter what else you do well, your customers will always remember that you short suited them in one or more ways. Recently my wife and I travelled interstate, and as is customary, we chose a recommended restaurant to fine dine at on one of the evenings that we were away. The food was exquisitely cooked and presented. And the price of the dinner was up there. In a big way. But the EXPERIENCE had gaping holes that detracted from the good parts of the evening. Firstly, for a fine dining experience, I expect tablecloths. Especially to cover over laminated tables. You certainly notice when the linen is missing. And it was missing on this evening. Secondly, a little bit of bread and oil would certainly go a long way. It’s not that diners notice the bread. It is that diners notice the absence of bakery. And bakery was absent here…. Thirdly, if you’re going to work in fine dining, you need to know the first rule of etiquette of table clearing, and that is, that you do not clear any plates from any course until ALL of the diners at that table have finished the course. At no time should plates ever be removed if one member of the dining party is still eating. Get the little things right. If the little things are done correctly, your customers will notice. But, they will also notice when the little things are NOT being done. And they will notice those BLEMISHES more if you are charging TOP DOLLAR for the things that you do. If you want to charge top dollar, you need to create an experience that is indeed watertight when it comes to being ABOVE and BEYOND. My wife chose the duck for main course. But, for $50.00, there were only five mouthfuls. If you’re going to charge top dollar, don’t underfeed your customers. They’ll think they’ve been short suited. Last week I posted an article outlining the first six inevitable criteria of success, according to an email I received, and my slant on how these criteria relate to the business of owning a dental practice. The post was a list of criteria, or conditions that business owners will experience as they journey along the pathway of life. 2. You Will Cry Before You Get It. 3. You Will Lose Friends. 4. Your family will discourage you. 5. People Will Hate You For No Reason. 6. You Will Almost Talk Yourself Out Of It a Hundred Times. If you’d like to understand these criteria in detail, then read last week’s article here. 7. You Will Doubt Yourself Thousands Of Times. Much like point six last week, there will be times, many times, when you will believe that you are making a wrong decision, and that you should not be venturing out past the security of employment, which is risk free. Sadly, the entertainment of thoughts like those is what kills the aspirations of many great would-be achievers. If only they had the cohunas to follow through with their original thoughts and aspirations. Don’t let self doubt position you on the wrong side of the filter. 8. You Will Think You Are Going Crazy. Your thoughts of self doubt will have you questioning your own sanity. Know that there are quantifiable rewards for those who stretch the envelope. And those rewards are definitely worthwhile. Some of the things that you do will appear a little obtuse to others who do not know you. But that doesn’t bother us. Successful entrepreneurs know that they themselves can become eccentric, or quirky, in behaviour. These strange characteristics are sometimes what makes the journey to success worthwhile. They are worthwhile acquirements that define us. 10. You Will Lose Money. This is a fact of business life. The aim is to make more successful decisions than unsuccessful decisions. And successful entrepreneurs know this, and they are OK with it. 11. IT WILL BE WORTH IT. If it wasn’t worth it, then nobody would bother. And because people do bother, and they do achieve, we are able to follow in their footsteps and achieve our own successes. And success is so, so worth it!